We have seen that the ancient tuner-scientists used the monochord in order to set up the consonant ratios of music. The monochord divisions are associated with the UNDER NUMBER SERIES outlined in the monochord articles. The central polarity of music, that which indicates the relation of reciprocity between wavelength and frequency, results in the existence of the OVER NUMBER SERIES, as well as the polarity between “up” and “down” within musical pitch. Just as the monochord divisions are connected with the Under Number Series and with wavelength, so also the Over Number Series connects with frequency and with the string Harmonics. The Under Number Series falls in pitch, whereas the Over Number Series rises in pitch. 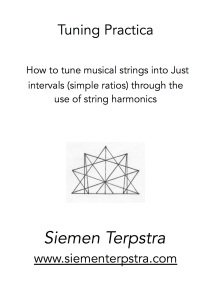 This entry was posted in Just Intonation on 1 December 2014 by Siemen.